Sign Up: The birthday club is completely free to join. Sign up with your email here. Make sure to enter all the kids in your family, so that your offers send to your inbox on the right dates. Birthday Party Discount. Receive $25 off our Basic 2 Hour Package or $40 off our Unlimited Jump or Family Unlimited Packages. PLUS add an additional child to either package for FREE. (Up to a total $60 value). This offer is sent to your inbox a few weeks before your child's birthday. Planning your party way in advance or last minute? No worries! Give us a call at (847)608-0600 and will assist in looking up your birthday club account manually. Open Jump Discount. A Buy One, Get One FREE offer to celebrate your child the week of their birthday. Valid towards one or two hour jumps. 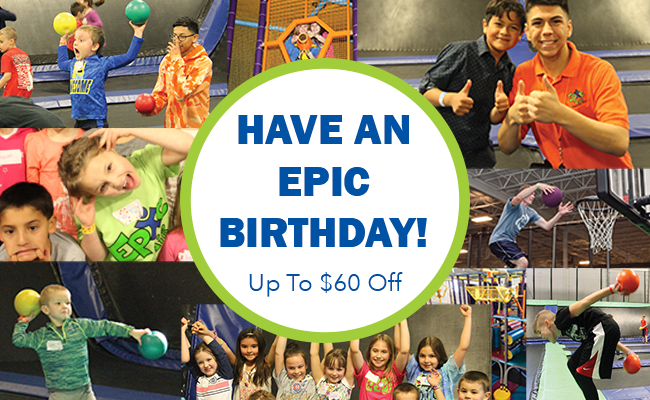 This offer is sent to your inbox the week before your child's birthday. How to Redeem: Easy! Show your discount at Epic Air. Please note that discounts cannot be applied to online sales.